Led by its Green Valley 400-yard freestyle relay, the Green Valley girls swimming team brought home a state championship. Green Valley’s girls swimming team was on the verge of taking down a dynasty in the Class 4A state championships on Saturday at UNLV, but the Gators had a nervous moment during the final race of the day. But in that event, the Gators 400-yard freestyle relay team of Liz Clinch, Rain Gavino, Lauren Olson and Valerie Kitchens held off a surging Palo Verde team to win the race and wrap up the team state championship. Palo Verde closed to second and made things nerve-racking for Green Valley as Kitchens dove in the pool to swim the anchor leg for the Gators. Green Valley finished in 3:34.05 to hold off the second-place Palo squad by 0.33 seconds. Green Valley finished with 94 points to outdistance the three-time defending state champion Panthers, who finished with 74. 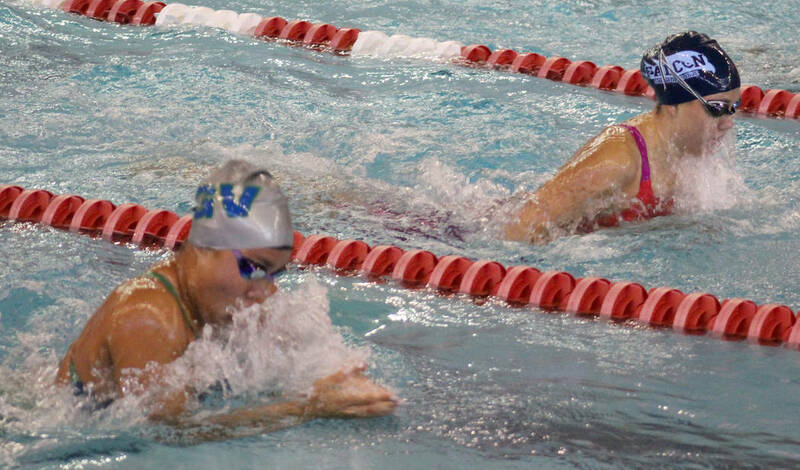 Kitchens also won the 200 individual medley for Green Valley, touching the wall in 2:05.80. Clinch, who ended up winning four races to power the Gators, said the key to dethroning Palo Verde was believing that they could. Clinch swam to first in the 100 butterfly, finishing in 55.69, and then pulled out the victory in the 100 backstroke with a time of 56.78. Clinch also joined Gavino, Kitchens and Olsen on Green Valley’s 200 medley relay squad that splashed to first with a time of 1:48.29. Gavino also won the 100 breaststroke in 1:04.56. Coronado’s Pilar Cohen won the 50 freestyle in 23.67 and the 100 freestyle in 52.0. 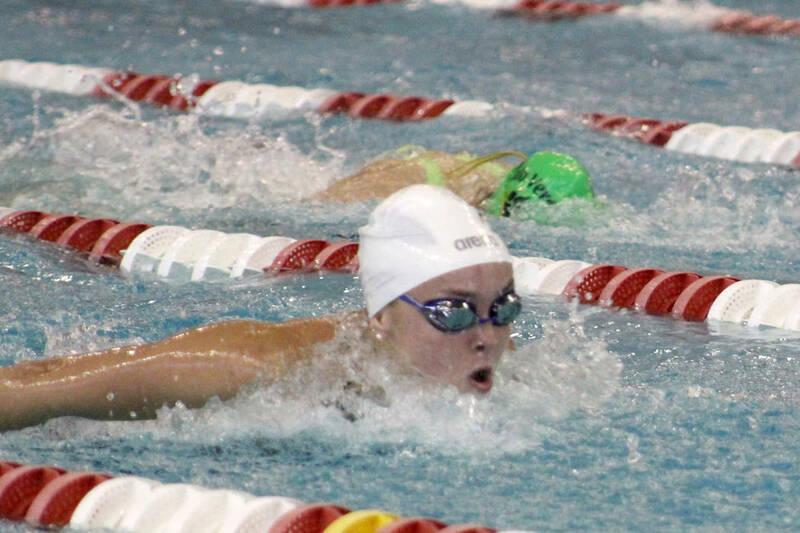 She also was part of the Cougars’ first-place 200 freestyle relay team. Astrid Villeda of Rancho won the 200 freestyle in 1:53.65, and took first in the 500 freestyle with a time of 5:01.62. Olivia Gordon of Bishop Gorman scored 501.25 points to win the girls 1-meter diving. 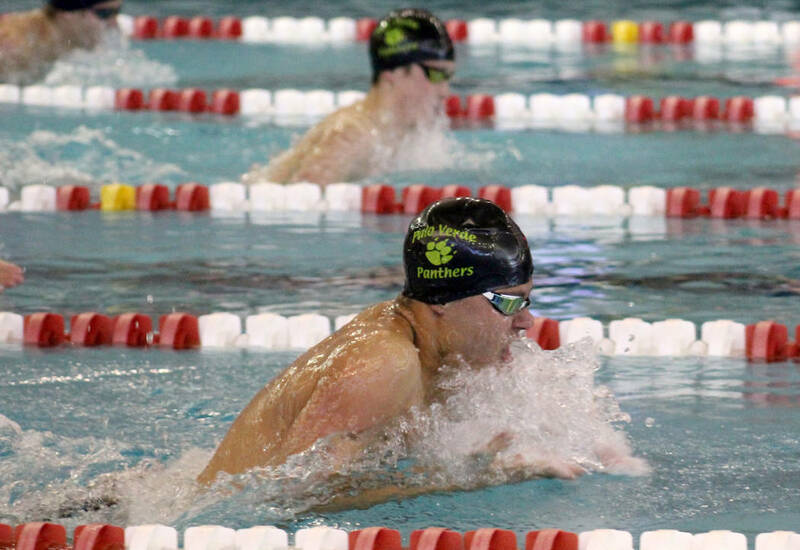 Palo Verde’s boys team continued its stranglehold on state swimming championships, as the Panthers won seven races on the way racking up 126 points to earn their sixth consecutive team title. It was their ninth title, moving past Reno for most in Nevada history. “Basically since we came home last year, they said were not going to lose state,” Panthers coach Brent Gonzalez said. “They went through the season, they were focused and they were going to do well. Green Valley was second with 83 points, and Coronado was third with 55. Palo Verde’s Dylan Sweikert edged Alexander Johannessen of Valley by 0.1 seconds to win the 100 freestyle (47.43). It was Sweikert’s third state title in the event, which tied him with Jordan Smith of Reno as the only three-time state champions in history in the event. Palo Verde’s Tyler Edlefsen pulled out a narrow win in the 200 individual medley, edging Legacy’s Tama Tuitama by 0.3 seconds, touching the wall in 1:50.4. Ahmed Mohamed and Edlefsen then finished 1-2 in the 100 breaststroke for Palo Verde, with Mohamed winning in 57.73. 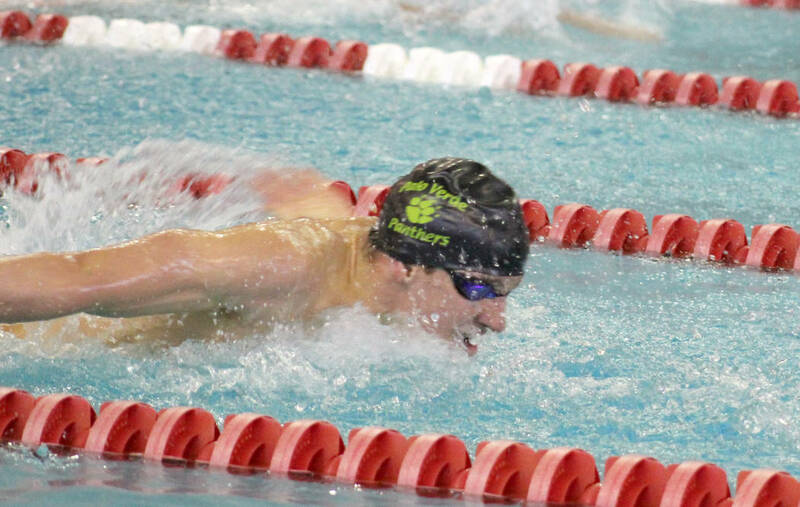 David Miller won the 100 butterfly in 49.91 for the Panthers. Gonzalez, who now stands alone with the most 4A boys state championships as a coach with six, said it was hard to name just one standout from his team. “It was pretty much everyone, as a team, went out and did what they had to do,” Gonzalez said. Runner-up Green Valley had a winner in the 200 medley relay, as Matas Maksimaitis, Mason Romantic, Andrew Navarro and Hunter Mecham took first with a time of 1:38.70. Coronado’s Timothy Newton became the first three-time state champion in boys diving, as he scored 506.75 points. Legacy had a 1-2 finish in the 100 backstroke, as McKay Mickelson won, finishing in 51.4, and Tuitama was second in 51.79.